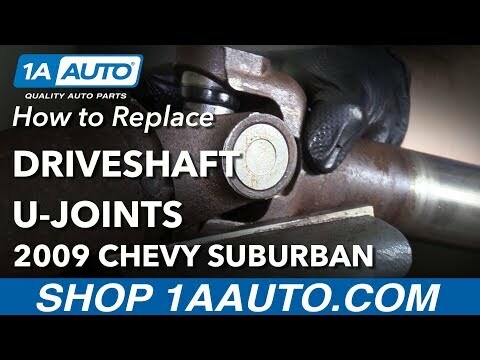 In the video, 1A Auto shows how to replace a broken or worn driveshaft u-joint. The video is applicable to the 07, 08, 09, 10, 11, 12, 13, 14 Chevy Suburban. i have never indexed any driveshafts that ive removed. in fact, many service manuals tell you to rotate 180 degrees from original position if you have vibration. in my opinion its a waste of time unless nothing was replaced. doing a u-joint defeats the purpose. Great video. Thank you guys !! Is this the same for a 97 tahoe? If not could you leave a link for how-to? Thank you. Tech tip #2, if you are pounding on a socket, hammer on the hex end, not the square end, it’s much easier to fix the hex end when you beat it to death. Pounding on the driveshaft with a socket is a disaster waiting to happen, bent ears, closing the grooves for the clips, you are replacing the u joint, pound on it. And enough with the rust penetrant already. It is nice to see a real world tutorial where things don't go perfectly in each step! Thanks for the great video! !